The 2017 Autumn party is being held at St George’s School Sports Hall, Sun Lane, Harpenden, Herts, AL5 4TD, on Saturday 14th October from 15.00-17.00. 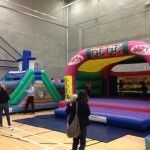 This is an excellent opportunity for your multiples to enjoy spending time with other multiples – the venue has bouncy castles, a bouncy obstacle course, play mats, balls – and LOTS of space to run around in! Come along and have fun – drinks and biscuits will be provided. There is no cost – it’s free for all members. The car park for St George’s can be found by driving up Sun Lane, going over the bridge and turning right onto Carlton Road. The car park is on your left. Follow the directions to the Heather Jarvis Sports Hall from the car park – it’s just a short walk away. For more details and directions to the school, see their own website.